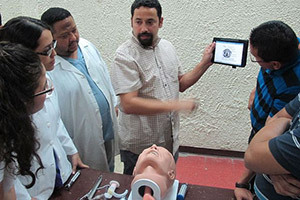 Dr. Luis Lovato explains airway anatomy to medical residents at the National Autonomous University of Nicaragua in Managua. UCLA physicians spent a week there teaching three courses to 50 local physicians. UCLA physicians recently traveled to Nicaragua to teach life-saving techniques to more than 50 local doctors as part of a weeklong course on resuscitating a patient after cardiac arrest and using ultrasound to diagnose life-threatening conditions at the bedside, among other critical topics. These classes were part of an education initiative by Project SEMILLA (Strengthening Emergency Medicine Investing in Learners in Latin America), a volunteer organization of emergency health care professionals and a partner of the UCLA Center for World Health. “Our aim is to help improve emergency health capacity throughout Latin America,” said Dr. Breena Taira, an assistant professor of clinical emergency medicine at UCLA, who led colleagues from Olive View-UCLA Medical Center on the trip. Project SEMILLA is one of many partner organizations that work with the UCLA Center for World Health in its aim to foster and support education, research and clinical capabilities in resource-poor countries like Nicaragua. A joint venture of the David Geffen School of Medicine at UCLA and the UCLA Health System, the three-year-old center and its partners currently participate in 170 projects in 65 countries worldwide. It focuses not only on education, training and capacity building, but projects also include research and clinical care initiatives. Patients from a pediatric program in Maputo, Mozambique, where the Center for World Health and its partners support training and education within the Department of Pediatrics. Acting as a catalyst, the center helps UCLA faculty develop and run diverse projects around the globe. UCLA medical students and residents can also apply to the center to participate in international research projects and clinical electives. UCLA students, for example, have helped create a neonatal resuscitation program in Ghana. Others have opted to learn about traditional medicine in China. Many of the programs guided by the center embody this vision, such as an education project in South Africa to help prevent transmission of HIV. South Africa has less than one percent of the world’s population, but 16 percent of the HIV infections, Coates explained. Teaming up with South Africa’s Human Sciences Research Council and Hivos, a nonprofit international development organization, the UCLA team is teaching community leaders about prevention, treatment and the latest science related to the infection, with the aim of reducing HIV-related stigma and discrimination. In 2014, 14 community leaders took a three-week intensive training course covering leadership skills, project management, HIV prevention and more. Using their newfound knowledge, participants developed pilot programs to address HIV prevention and HIV-related stigma in their communities. Dedicated mentors ensure that the pilot programs stay on track and have a measurable impact at the community level. “The program has a uniquely transformative effect — for both the participants and the communities in which they work,” said Laurie Bruns, the center’s senior Africa regional director. Because black South African men with HIV don’t get tested until it’s too late, Coates is also directing a research program to help this group and others gain early access to medical services. The initiative is evaluating innovative strategies to test for, diagnose and treat HIV in this critical population. Coates’ team is partnering with the Human Sciences Research Council in South Africa and Charles University in Prague on this project. The UCLA center has found partners to advance medical care in China. The University of California and UCLA Department of Pathology are working with Centre Testing International Corp., a Chinese firm, to create a company that will operate a clinical laboratory in Shanghai. The new lab will support clinical trials and enhance medical care for Chinese patients with cancer and other diseases. “Such joint ventures share UCLA’s vision of developing strong international relationships to help improve health worldwide,” said Dr. Tom Rosenthal, associate vice chancellor, chief administrative officer for the UCLA Health System and co-director of the Center for World Health. Another important program under the center’s umbrella focuses on substance abuse treatment in the Middle East. A team from UCLA's Integrated Substance Abuse Program is collaborating with Jazan University in Saudi Arabia to provide expertise to psychiatrists in addiction research. “We are helping to change the paradigm of drug abuse approaches in the Middle East by providing hands-on experience with the latest treatment information,” said Rick Rawson, co-director of the UCLA program and professor-in-residence in the Department of Psychiatry and Biobehavioral Sciences. In addition to addressing patient needs, another cornerstone of the UCLA Center for World Health’s mission is to educate future health care leaders. This year, the center and its partners will send six UCLA pediatric residents to Thailand for a month-long global health experience to learn about infectious diseases, hematology and pediatric intensive care there. In return, the UCLA Department of Pediatrics will host five visiting residents from Bangkok's Siriraj Hospital who will learn about their specialties. “This important cultural and medical exchange helps strengthen our worldwide knowledge and provides a good perspective for our future doctors,” said project leader Dr. Tanya Arora, assistant clinical professor of pediatrics at UCLA. Along those same lines, Dr. Jorge Lazareff, director of international relations for the UCLA Center for World Health, is aiming to launch a project in 2016 that utilizes the latest Internet technologies so clinicians and surgeons across the globe can discuss patient cases during “real-time” grand rounds. In addition, he has launched an online lecture series in Ecuador and Nicaragua to teach medical students and physicians how to understand, write and prepare medical journal articles. So far, the lectures have reached 60 students; the plan is to expand into other countries with versions in multiple languages. On Saturday, UCLA faculty from the Geffen School of Medicine and the Fielding School of Public Health, among other health care experts, will participate in an all-day conference at UCLA sponsored by the UC Global Health Institute to mark 2015 UC Global Health Day. Coates, who is co-director of the institute, is chairing the event. On April 23, UCLA Staff Assembly will present a Learn-at-Lunch event: "What Can We Do About Global Health: Priorities of the UCLA Center for World Health."